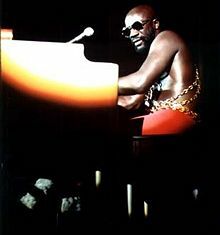 Isaac Lee Hayes, Jr. (August 20, 1942 – August 10, 2008) was an American soul and funk singer-songwriter, musician, record producer, arranger, composer, and actor. Hayes was one of the main creative forces behind the southern soul music label Stax Records, where he served as both an in-house songwriter and producer with partner David Porter during the mid-1960s. In the late 1960s, Hayes became a recording artist, creating successful soul albums such as Hot Buttered Soul (1969) and Black Moses (1971). Alongside his work in popular music, Hayes was a film score composer for motion pictures. His best known work, for the 1971 blaxploitation film Shaft, earned Hayes an Academy Award for Best Original Song—the first Academy Award received by an African-American in a non-acting category—and two Grammy Awards. He received a third Grammy for the album Black Moses. Hayes also acted in motion pictures and television, famously providing the voice for the character "Chef" on the Comedy Central animated TV series South Park from 1997 to 2006. Hayes' songs contributed heavily to the Black Pride Movement, helping to establish a sense of African-American identity and cultural awareness. Hayes was born in Covington, Tennessee, the second-born child of Isaac Sr. and Eula Hayes. After their deaths, he was raised by his grandparents. The child of a poor family, he grew up picking cotton and dropped out of high school, but was later encouraged by his former high-school teachers to get his diploma, which he earned at the age of 21. He began singing at the age of five at his local church, and, soon after, he taught himself to play the piano, organ, flute, and saxophone. Hayes began his recording career in the early 1960s as a session player for various acts of the Memphis-based Stax Records. He later wrote a string of hit songs with songwriting partner David Porter, including "You Don't Know Like I Know," "Soul Man," "When Something Is Wrong with My Baby," and "Hold On I'm Comin' for Sam and Dave." Hayes, Porter, and Stax studio band Booker T. & the MGs served as the main production team for much of the label's output during the early and mid-1960s. 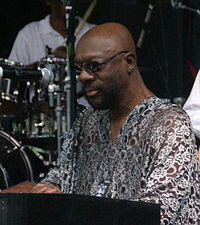 In 1968, Hayes released his debut album, Presenting Isaac Hayes, a jazzy, largely improvised effort that was commercially unsuccessful. His next album was Hot Buttered Soul, which was released in 1969 after Stax had gone through a major reorganization. This album is noted for Hayes' distinct sound, featuring extended orchestral songs heavy on organs, horns, guitars, and deep bass vocals. Hayes re-interpreted "Walk On By," made famous by Dionne Warwick, into a 12-minute exploration. "By the Time I Get to Phoenix" starts with an eight-minute-long monologue before breaking into song, and the lone original number, the funky "Hyperbolicsyllabicsesquedalymistic" runs nearly ten minutes, a significant break from the standard three minute soul/pop songs. "Walk On By" would be the first of many times Hayes would take a Burt Bacharach standard, often made popular as a three-minute hit song by Dionne Warwick or Dusty Springfield, and transform it into an soulful, lengthy, almost gospel-style number. In 1970, Hayes released two albums, The Isaac Hayes Movement and To Be Continued. The former stuck to the four-song template of his previous album. Jerry Butler's "I Stand Accused" begins with a trademark spoken word monologue, and Bacharach's "I Just Don't Know What to Do with Myself" is thoroughly re-worked. "The Look Of Love," was another Bacharach song transformed into an 11-minute epic of lush orchestral rhythm, breaking midway through into a rhythm guitar jam before suddenly resuming the slow love song. An edited three-minute version was issued as a single. The album also featured the instrumental "Ike's Mood," which segued into Hayes' own version of "You've Lost That Loving Feeling." Hayes released a Christmas single, "The Mistletoe and Me" (with "Winter Snow" as a B-side). In early 1971, Hayes composed music for the soundtrack of the blaxploitation film Shaft. He also appeared in the movie in a cameo role as the bartender of No Name Bar. The title theme, with its wah-wah guitar and multi-layered symphonic arrangement, would become a worldwide hit single and spent two weeks at number one in the Billboard Hot 100 in November. The remainder of the album was mostly instrumentals covering big beat jazz, bluesy funk, and hard Stax-styled soul. Two of the album's vocal numbers, the social commentary "Soulville" and the 19-minute jam "Do Your Thing," would be edited down to hit singles. Hayes won an Academy Award for Best Original Song for the "Theme from Shaft," and was nominated for Best Original Dramatic Score for the film's score. Later in the year, Hayes released a double album, Black Moses, that expanded on his earlier sounds and featured The Jackson 5's song "Never Can Say Goodbye." The single "I Can't Help It" was released separately from the album. In 1972, Hayes would record the theme tune for the TV series The Men, which also became a hit single, with "Type Thang" as a B-side. He released several other non-album singles during the year, such as "Feel Like Making Love," "If Loving You Is Wrong (I Don't Want To Be Right)," and "Rolling Down a Mountainside." In the same year, Atlantic would re-release Hayes' debut album with the new title, In The Beginning. In 1973, Hayes released an acclaimed live double album, Live At Sahara Tahoe and followed it up with the album Joy, featuring the eerie beat of the 15-minute title track. An edited version of "Joy" would be a hit single. In 1974, Hayes was featured in the blaxploitation films Three Tough Guys and Truck Turner, and he recorded soundtracks for both. By 1974, Stax Records was having serious financial problems, and Hayes himself was deep in debt to Union Planters Bank, which administered loans for the Stax label and many of its other key employees. In September of that year, Hayes sued Stax for $5.3 million. The label made an arrangement with Hayes and Union Planters: Stax released Hayes from his recording and production contracts, and Union Planters would collect all of Hayes' income and apply it towards his debts. Hayes then formed his own label, Hot Buttered Soul, which released its products through ABC Records. His new album, 1975's Chocolate Chip saw Hayes embrace the disco sound with the title track and lead single. "I Can't Turn Around" would prove a popular song as time went on. This would be Hayes' last hit album for many years. Later in the year, the all-instrumental Disco Connection album fully embraced disco. In 1976, the album cover of Juicy Fruit featured Hayes in a pool with naked women. Later the same year, the Groove-A-Thon album featured the singles "Rock Me Easy Baby" and the title track. However, while all these albums were regarded as solid efforts, Hayes was no longer selling well. He and his wife were forced into bankruptcy in 1976, and by the end of the proceedings in 1977, Hayes had lost his home, much of his personal property, and the rights to all future royalties earned from the music he had previously written, performed, and produced. In 1977, Hayes was back with a new deal with Polydor Records. A live album of duets with Dionne Warwick did moderately well. His comeback studio album New Horizon enjoyed a hit single "Out The Ghetto" and also featured the popular "It's Heaven To Me." For The Sake Of Love (1978) saw Hayes record a sequel to "Theme from Shaft" ("Shaft II"), but was more famous for the single "Zeke The Freak," a song that would have a shelf life of decades and be a major part of the House movement in the UK. The same year, Fantasy Records, which had bought out Stax Records, released an album of Hayes' non-album singles and archived recordings as a "new" album, Hotbed. In 1979, Hayes returned to the Top 40 with Don't Let Go and its disco-styled title track that became a hit single (U.S. number 18), and also featured the classic "A Few More Kisses To Go." Later in the year he added vocals and worked on Millie Jackson's album Royal Rappin's. Neither 1980s And Once Again or 1981's Lifetime Thing produced notable sales, and Hayes chose to take a break from music to pursue acting. He appeared in numerous films, notably Escape from New York (1981), I'm Gonna Git You Sucka (1988), Prime Target (1991), Robin Hood: Men in Tights (1993), and Johnny Mnemonic (1995), as well as in episodes of The A-Team and Miami Vice. He also attempted a musical comeback, embracing the style of drum machines and synth for 1986s U-Turn and 1988s Love Attack, though neither proved successful. In a rather unexpected career move shortly thereafter, Hayes charged back into the public consciousness as a founding star of Comedy Central's controversial—and wildly successful animated TV series, South Park. Hayes provided the voice for the character of "Chef," the amorous elementary-school lunchroom cook, from the show's debut on August 13, 1997, through the end of its ninth season in 2006. In the South Park episode "Trapped in the Closet," a satire and exposé of Scientology which aired on November 16, 2005, Hayes did not appear in his role as Chef. On March 13, 2006, he issued a statement indicating that he was asking to be released from his contract with Comedy Central, citing recent episodes which satirized Scientology's religious beliefs as being intolerant and incompatible with his conscience. Hayes was inducted into the Rock 'n Roll Hall of Fame in 2002. The same year, a documentary highlighting Isaac's career and his impact on many of the Memphis artists in the 1960s onwards was produced, "Only The Strong Survive." In 2004, Hayes appeared in a recurring minor role as the Jaffa Tolok on the television series Stargate SG-1. The following year, he appeared in the critically acclaimed independent film Hustle & Flow. On March 20, 2006, Roger Friedman of Fox News reported that Hayes had suffered a stroke in January, and his live performances reportedly were noticeably sub-par. In April 2008, while a guest on The Adam Carolla Show, Hayes stumbled in his responses to questions, possibly as a result of health or related issues. During the spring of 2008, Hayes shot scenes for a comedy about soul musicians inspired by the history of Stax Records entitled Soul Men. On August 10, 2008, he was found unconscious in his home located just east of Memphis, Tennessee. A Shelby County Sheriff's deputy responded to Hayes's home after his wife found him on the floor near a still-running treadmill. Hayes was taken to Baptist Memorial Hospital in Memphis, where he was pronounced dead at 2:08 p.m. At the time of his death, he was preparing his first new studio album since 1995. He is buried in Memorial Park Cemetery in Memphis. While younger people know Isaac Hayes from South Park, his iconic breakthrough album came in 1969 with his Hot Buttered Soul, which was ripe with artistic innovation: extended orchestral songs heavy on organs, horns, guitars, and deep bass vocals. Hayes was also influential as a songwriter and producer for Stax Records in Memphis—the pioneering 1960s R&B label—that was widely thought to be the southern counterpart to Motown in Detroit. Memorable compositions from this period include Hayes' Soul Man, originally recorded by Sam & Dave, and later a big hit a second time when it was covered by the Blues Brothers in 1978. Hayes songs contributed heavily to the Black Pride Movement, helping establish a sense of African-American identity and cultural awareness. In 1971, his Theme from Shaft won an Oscar—the first non-acting Oscar for an African American—and his performance at the Academy Awards rocketed him into the national consciousness. Hayes fathered 12 children, and had 14 grandchildren and three great-grandchildren. His fourth wife Adjowa gave birth to a son named Nana Kwadjo Hayes on April 10, 2006. One son is his namesake, Isaac Hayes III. 1966: "Your Good Thing (Is About to End)" by Mabel John (later a big hit by Lou Rawls) . Boston, Lloyd. Men of Color: Fashion, History, Fundamentals. New York: Artisan, 1998. ISBN 978-1579651121. Corio, David, & Goldman, Vivien. The Black Chord: Visions of the Groove: Connections Between Afro-beats, Rhythm & Blues. Hip Hop, and More. New York: Universe, 1999. ISBN 978-0789303370. Phinney, Kevin. Souled American: How Black Music Transformed White Culture. New York: Billboard Books, 2005. ISBN 978-0823084043. Ramsey Jr., Guthrie P. Race Music: Black Cultures from Bebop to Hip-hop. Berkeley: University of California Press, 2003. ISBN 978-0520210486. This page was last modified on 6 March 2018, at 19:36.